The Coopered Tot: Lost Spirits Leviathan 1 is a bold new stroke - but very young yet. 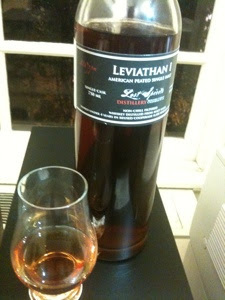 Lost Spirits Leviathan 1 is a bold new stroke - but very young yet. Lost Spirits Distillery is a very new and extremely exciting craft distiller on California's coast with an incredibly cool wooden steam still with a dragon head on its soaring Lyne arm and a wonderfully compelling story about local grain, carefully chosen peat and exotic California wine barrels. Never have I seen so much excitement build so quickly about a totally new out of the blue American craft whisky. I first heard about Lost Spirits distillery in August when there was a flood of blog posts, which started with David Driscoll of K&L's introduction which features great pictures of malt smoking, Canadian peat, and a video interview with Bryan Davis, one of the two wonderfully knowledgeable and whisky geeky folks behind Lost Spirits. Josh Hatton of Jewmalt did a profile less than a day later with his signature brilliant illustrated symbolic tasting notes. 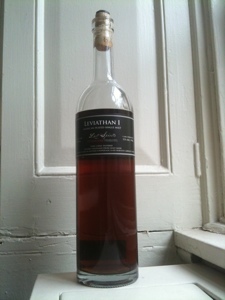 Bryan & Joanne were nice enough to send me a bottle of LeviathanI for review. This bottle will he headed to Mark in South Africa directly! 100% California malted barley smoked with coarse cut Canadian peat and "stored for under 4 years in reused cooperage (late harvest Cabernet casks)." The palate entry is huge and off dry with powerful notes of leather, chocolate, yeast, wet animal (like llama or alpaca (my father-in-law keeps alpaca)) and malt sugars. The mid palate expansion introduces a filigree of oak wood with a richly earthy smoky quality and a dark and vinous aspect in the integration of sweet and smoke. There's dark chocolate, and roasted ground coffee beans. A vegetal note creeps in at the turn to the finish like kale or chard. It's an amazingly distinctive flavor profile full of bold and unexpected flavors. The yeast note bothers me, however, and I recognize it as a sign of a very young spirit. 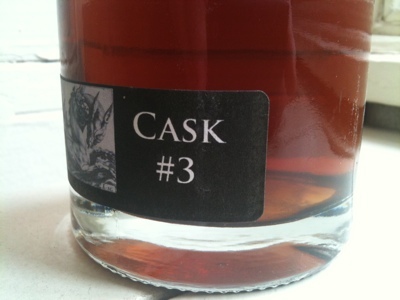 With extended time a bit of honeyed richness wells up in the palate - as often happens to me with malt whisky. But it doesn't banish the yeast and wet animal quality that I find off putting. I get some of this from Wasmund's Copper Fox Malt and I recall a bit of it from Corsair Triple Smoke. 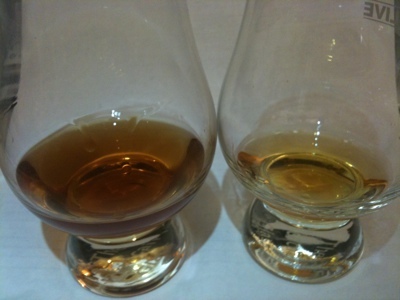 I queue up a dram of Triple Smoke for a head to head comparison. Well - side by side they have much less in common that m recollection showed. 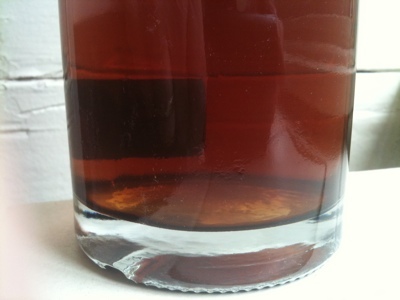 Triple smoke is dramatically lighter (golden), clearer (less cloudy), lower in proof (at 40%) and lighter in flavor. 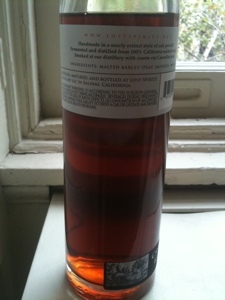 It has a dramatically lighter flavor density and almost comes off as a conventional younger malt whisky side by side. There are some young yeast notes, but Triple Smoke is gently malty, lightly and sweetly smoked with cherry notes dominating. Leviathan by contrast is dark, rich, titanically dense, and full of these intense flavor notes: particularly the bitter smoky wet animal, roasted coffee and cacao bean quality. The kiss of yeast which I find reminds me of new make and young whisky is a common element - but there is very little else in common; not even the quality of being smoked. Lost Spirits is an extraordinarily innovative distillery and there are marks of brilliance all over Leviathan1 - ranging from unique ingredients and unusual production methods yielding a densely flavored spirit which is dramatically different. However the flavors of new make and some off flavors put me off. I'm reluctant to come down too definitively because I had a similarly negative first impression of Balcones Brimstone and it became one of my favorite drams with time and acclimation. I'm less sanguine about Leviathan. I think I need it to have more time in the wood to conquer the yeast and maybe I need to seek out Seascape to find something with a bit less of the titanic and unfamiliar form of peat. I'm still going to recommend it because it's so obviously crafted and so full of innovation. It is worth trying and there are many who will love this. But at the moment, not me. I will keep an eagle eye on this project, however. It shows enormous promise. That whisky is eerily dark. It's getting into Loch Dhu territory. It does sound like they're doing some interesting stuff, but I think I'll wait until their whiskey has at least a few more years in oak. Even three years would probably be helpful, but five would be better. That dark color is coming from those boyterized wine casks and the intense 110ppm phenol levels of big coarse cut Canadian peat smoke - lots of it. Try it if you get an opportunity. The reaction I had may not be yours. This kind of big flavor has a possible angle for cocktails too. It will definitely make its presence known. That being said, I expect it benefit from maturation. I just hope by the time it's has matured and is becoming refined and august I'll still be able to afford it! That color is kind of weirding me out. It almost looks artificial. It's not artificial, Bob. Lost Spirits bends over backwards to make a product that is 100% organic, and unmessed with. What you're seeing in that dark color is intensely smoked highly peated malt. The phenol levels are 110ppm. This is the same as Ardbeg Supernova - up close to Octomore levels. This is among the highest peated whiskies in the world. Supernova and Octomore are pale. This one is dark because of the method of smoking the malt. 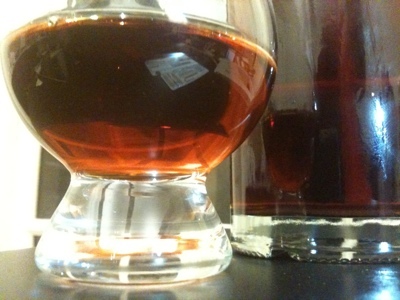 It's clearly connected with the intensely strong flavor profile is clearly deliberate on the part of the distiller. I'm dubious about that, Josh. Smoking the malt shouldn't have anything to do with the color of the spirit, because distillate should come out clear 100% of the time. Any color should either be from the barrels or because of additives. And phenolics have nothing to do with color, because they're all white or off-white compounds. You are the chemist, Jordan. I accept your assessment that the color must be coming from the barrels or additives. I'll put the question to Bryan of Lost Spirits and get back to shortly in this space. Was ever an answer supplied Re: the color? Is it because of the red wine barrels? I was under the impression this was all organic as well, so I'd be curious to know. Yes - thanks for asking. Bryan Davis wrote back saying that the color was "a miracle". Sure enough subsequent batches of Leviathan, such as Leviathan 2, are not as dark. It is an organic product - and the red wine barrels certainly do add color - but these factors can't explain the extraordinary darkness of Leviathan 1 b3.